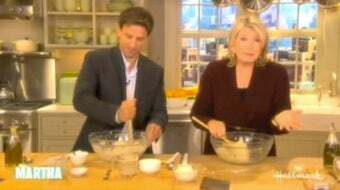 On her show today, Martha Stewart made pizza with Seth Meyers while complaining that she's never been invited on Saturday Night Live. Well, she was asked, but "for some reason they didn't let me go on. It was during probation." Seth remarks that Martha's the only person he knows who has been on probation, to which she replies, "Isn't that crazy, I'm so nice!" How quickly she forgets that time she humiliated him in front of Roberto Cavalli.